Many of the largest companies in the U.S. are putting some of their record piles of cash to work by boosting their hiring. Collectively the nation’s biggest companies added 4.2% more net jobs globally in 2011, based on S&P Capital IQ’s analysis of the 437 companies in the Standard & Poor’s 500 that reported employee statistics. Small companies are typically the biggest drivers of new jobs, but seeing larger firms increasing staff is encouraging. “It’s refreshing to see these job gains at these large companies,” says Jack Ablin of Harris Private Bank. Barrett Business Services has agreed to purchase approximately 2.5 million shares from the estate of William W. Sherertz, the company’s late chief executive, in a deal valued at about $59.7 million. Under the terms of the deal, Barrett Business will also purchase 500,000 shares from Nancy Sherertz. Barrett Business president and chief executive Michael Elich says the company thinks the stock repurchase will be accretive to shareholders. Jennifer Abernethy, author of The Complete Idiot’s Guide to Social Media Marketing, will teach you what needs to be on your Web site, what your firm should be doing on Facebook and LinkedIn, and more. ASAPro Webinars are free for ASA members ($295 for nonmembers) and qualify for continuing education hours toward ASA certification renewal. 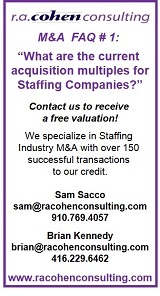 Register online at americanstaffing.net. 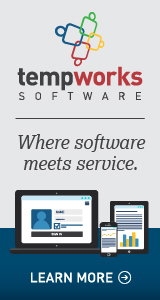 Need real-time data on temporary help employment? The ASA Staffing Index reports weekly changes in the number of people employed in temporary and contract work. The data will help your firm evaluate its performance against a national metric on both a weekly and long-term basis. All U.S. staffing firms are invited to participate in the ASA Staffing Index survey. Every Tuesday, participants receive an e-mail with the results of the weekly survey, including sales group figures. These data, which are not available anywhere else, allow staffing firms to compare how their business is doing on a weekly basis relative to similarly sized firms in the industry. There are no fees for participating in the survey. Don’t get stuck with outdated data—sign up to participate in the ASA Staffing Index and receive the most up-to-date information about the staffing industry. Check the latest data for the week ending March 4 at americanstaffing.net . The New Hampshire House of Representatives will vote this week on a bill that would prevent the state to mandate use of the federal E-Verify online database to check citizenship status. Bill supporters assert that the federal system—while being used by employers to verify legal residency—is being turned into a national ID card system that would threaten New Hampshire residents’ privacy. Employers can continue to use the federal system. In the past, information technology companies that moved their H-1B eligible workers from one work location to another simply applied for a new Labor Condition Application. However, that is no longer adequate. Companies now must report any change or addition of work location to U.S. Citizenship and Immigration Services through an H-1B Amendment. Companies that fail to file an H-1B Amendment risk receiving a Notice of Intent to Revoke an already approved H-1B petition. As an estimated one million veterans return to the workplace, the U.S. Department of Labor and the U.S. Equal Employment Opportunity Commission are preparing for veteran-related litigation. Employers can expect a renewed focus on the Uniformed Services Employment and Reemployment Rights Act, the EEOC’s recently issued guidance for veterans on the Americans with Disabilities Act, and the DOL’s proposed regulations regarding “military-related” leave under the Family and Medical Leave Act. Employers should begin preparing to facilitate successful transitions for veterans returning to the civilian work force. USERRA prohibits employers from discriminating against employees or applicants for employment on the basis of their military status or military obligations. It also protects the reemployment rights of individuals who leave their civilian jobs to serve in the uniformed services, including the U.S. Reserve forces and state National Guard units. Unlike many other federal statutes, USERRA applies to all employers, regardless of size. DOL’s recently proposed regulations on the Family and Medical Leave Act were intended to interpret the National Defense Authorization Act of Fiscal Year 2010, which was enacted after the most recent version of the FMLA regulations became effective in January 2009. Employers need to be sure that they avoid discriminating against veterans, that they make all necessary reasonable accommodations, and that they comply with these laws. Violators are unlikely to get much sympathy from any quarter. A report by the World Economic Forum and the Mercer consultancy calls talent mobility “much more than” just international assignments. All private and public entities must work together on talent-mobility initiatives to smooth the economic recovery, according to the study. “Talent mobility is an enabler for private companies, governments, academic institutions, and non-governmental organizations to close skills gaps and remedy talent shortages while also moving more people to employability and employment,” according to the report Talent Mobility Good Practices: Collaboration at the Core of Driving Economic Growth. California employers’ costs of providing workers’ compensation insurance increased slightly in 2011, but are still barely half of what they were before then-Gov. Arnold Schwarzenegger and the Legislature enacted a major overhaul of the system in 2004. The annual report of the Workers’ Compensation Insurance Rating Bureau was released on March 12, and found that the average cost of workers’ comp insurance increased from $2.32 per $100 of payroll in 2010 to $2.37 in 2011 as payouts to injured workers and their medical care providers also rose from $7.8 billion to $8.1 billion. In 2003, coverage averaged $6.29 per $100 of payroll but after the reforms, which tightened eligibility for benefits, it dropped to as low as $2.16 in 2008 before beginning a slow rise. Payouts also dropped from $12.3 billion in 2002 to as low as $6.7 billion in 2005 before also beginning a slow rise. West Valley Staffing Group expects staffing levels among Silicon Valley employers to rise or hold steady through the second quarter. The staffing firm’s Economic Survey of more than 350 hiring managers in such industries as electronics, semiconductors, medical, manufacturing, finance, and alternative energy reveals that 91% of hiring managers expect increased or steady hiring, while just 9% anticipate a decline in staffing needs. This marks the fourth consecutive quarter of employment growth. About 39% predict a jump in hiring needs, while 52% believe hiring needs will remain unchanged.